Several operators offers bus services across the UK & Europe but the Aberdeen to Blackpool journey is only served by the company National Express. Our travel data found that for the next month, and based on a standard fare without a coachcard, the lowest price across the different companies to travel by bus from Aberdeen to Blackpool is from €29.20. It takes on average 10h12m to travel by bus between the two cities. 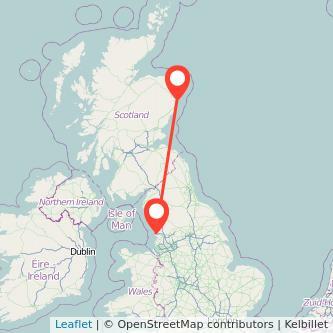 While coach services are normally slower than trains or flights, they are almost always the cheapest way to cover the 233 miles between Aberdeen and Blackpool. Find the cheapest tickets to travel from Aberdeen to Blackpool by coach, train, carsharing and flights. We analysed the evolution of the prices for your coach from Aberdeen to Blackpool to understand the best time to get your ticket. The graph above reveals that prices are not increasing or decreasing a lot the closer you get to your departure day. You will pay approximately the same amount if you purchase your ticket in advance or on the day you intend to travel but by purchasing in advance, you will make sure that tickets remain available for your trip. Gopili compares prices to help you find cheap bus tickets from Aberdeen to Blackpool for the coming days. You can also have a look at the prices for the Blackpool Aberdeen bus to make sure you get a seat for your return journey.